The Township of Albany derives its name from the old Connecticut town of that name, which included in its limits the present township, the old town being named by a party of Gentlemen who were formerly residents of the city of Albany, in the State of New York, and who purchased a large tract of land in the southern part of the county of Bradford. The principal stream which waters the town is the south branch of Towanda creek, whose bead-waters are in and about the southeastern portion of the township. Its course is westerly and northerly through the township, and passing therefrom about two miles southwest of the northeast corner thereof into Monroe township. The tributaries of the south branch are Beaver Meadow branch, coming in from the southwest, just below New Albany, and Brown's creek, which fills into the main stream just above the last-named place, also common in from the western part of the town. Sugar Run creek heads in the northeastern part of the township, and runs eastward into Terry township near the southern angle of the last-named town. The head-waters of the Loyal Sock are also in this township. The surface of the township is broken. Along the south branch of the Towanda, on either side, high table-lands are found with a good soil, and well adapted to grazing; narrow valleys are found also along the tributaries of the principal streams and about the Sugar Run. The township is situated between the towns of Monroe on the northwest, Overton on the west, Asylum on the northeast, Terry and Wilmot on the east, and Sullivan county on the south. It is centrally distant from Towanda about eleven miles, with which place it is connected by the Sullivan and Erie railroad, which passes through the township, following the valley of the south branch of the Towanda creek, with stations at Laddsburgh, New Albany, and Wilcox. The first settlers up the Fowler branch of the Towanda creek came thereto in the month of April, 1800. They were Ephraim Ladd and his sons, Horatio, Charles W., and John; Joseph Langford; Jonathan and Rogers Fowler, brothers. In 1801, Sheffield Wilcox and his sons, Freeman, Rowland, and Sheffield, Jr., Edward Warren, and a Mr. Granger came in. The Ladds came from Tolland Co., Conn. Ephraim was the first of the family who came to Albany to live, they stopping for a time at Monroe. While the family yet resided in the latter place, Horatio came up into the present township, and cut the first brush heap piled up by the present settlers in the township. He had to cross the creek thirteen times in going up to find a practicable pathway. Ephraim settled about forty rods farther north than Horatio, and lived there until the spring of 1829, when, with his son, be moved into Northumberland Co., Pa., where he lived until his death in May, 1836, it the age of eighty-seven years. Horatio lived in Towanda or Monroe about five years, and in 1805 moved to his farm near the present New Albany railroad depot. At this date there bad never been a wagon up the creek. He died in January, 1850. Charles W. Ladd married a sister of Mr. Alden, and his farm joined Horatio's. He built the stone house at New Albany in 1819, Horatio Ladd and Daniel Miller building the same year. Charles W. lived in the stone house until his death in 1832. He was the first postmaster in Albany, having been appointed in 1820 or 1821. John Ladd died in 1801, before he attained his majority. Joseph Langford was an early settler but made no permanent settlement, but in a short time after coming to the township moved to Spencer, N. Y.
Sheffield Wilcox, Sr., located where Amazi Heverly now resides. He removed from Rhode Island to Cooperstown, N. Y., where he remained for a time, and then came to Albany, in 1801. His family consisted of his wife and the following children: Andrew, Thomas, Lois, Freeman, Rowland, Eunice, Sheffield, Jr., Desire, Amy, and Jemima. Mrs. Wilcox was a Ross, and died in Albany, in 1812. The emigrants cut their own road beyond Monroeton, through an unbroken wilderness. The Yankees came into the county under the Connecticut title. Captain Brockaway owned the township under that title, and the first settlers agreed to pay for their land as they were able; but soon discovering that Brockaway's title was worthless, they paid him nothing. Joseph Priestly held the Pennsylvania title for a large portion of the township, the south line of his tract being about a half-mile north of the south line of the township. He sold his lands to the settlers for two dollars and a half per acre, for which twenty five acres of land each, but to be taken or located on different tracts - and to the next four, fifty acres each, on the same conditions, in order to induce emigration and bring his lands into market. This offer being made known to the Wilcoxes and Ladds, they were induced to come and settle on the lands. Ephraim Ladd, Horatio Ladd, Sheffield Wilcox, Sr., and his son, Sheffield, Jr., each obtained the seventy-five acres offered by Mr. Priestly. The Wilcoxes moved in on ox-sleds. Panthers were numerous, and bears and deer were without number. It was a wild and dreary country, but the heavy growth of timber led the settlers to believe that the soil was of unbounded fertility. But the first few years were years of struggle, and hardship to clear up the heavily timbered lands and fit them for cultivation. There was not even a place large enough to place the logs of which their rude homes were made, until the trees were felled and the stumps cleared away. There was but one house between the Fowlers, in Monroe, and Mr. Wilcox's, the same being that of John D. Sanders, who afterwards removed west. Mr. Wilcox cleared off a small patch for corn, and the family lived on its proceeds and the game which abounded. He had to confine his sheep every night in a yard to keep them from destruction by wild beasts. One night, in Mr. Wilcox's absence from home, a panther killed a sheep within a few feet of the house, ate what be wanted of the carcass and left the remainder. The next morning, on Mr. Wilcox's return, he and his son took their rifles and dogs, and started in pursuit of the depredator, which they discovered about half a mile from the house, and soon dispatched him. Mr. G. Wilcox died suddenly Oct. 24, 1812, and Mr. Wilcox in 1831, over seventy years of age. Sheffield Wilcox, Jr., married Charlotte, daughter of John Hinman, of Wysox; built and lived in the hotel at Wilcox Station, on the Sullivan and State Line railroad, and kept the house until a year or two before his death, in 1871, in the eighty-ninth year of his age. He put up the first framed building in the township, a barn, as early as 1813. he drew the lumber from Fowler town. The frame, including the rafters and plank for the floors, was all hewed. The hotel was built in 1821, and the sign raised in 1822. Wells Wilcox, a son of Sheffield Wilcox, Jr., now resides in the township, aged seventy-four years. Rowland Wilcox married Elizabeth Van Etten, from Spencer, New York, and lived and died on the old Wilcox homestead. He built the first framed dwelling-house in the township, in 1814. His son Benjamin is the only one of this family now living, and resides near the Wilcox homestead. Freeman Wilcox was the only one of his father's family who was married at the time they migrated to this county. His wife was Clarissa Southworth (commonly called Southard), of Windham, Connecticut. Mrs. Charlotte Ormsby, now living in the township, was the first-born child of this family., and was born in Monroeton, near the bridge over the main branch of Towanda creek. About 1805, Mr. Wilcox moved to the farm on which Wm. Bahr now lives, about three-fourths of a mile south of New Albany post-office. He built a little cabin of brush and bard beside a log, where he lived until he could build a log cabin. Mr. Wilcox's family comprised eight children, four of whom died young. The others were Charlotte, Mrs. Dyer Ormsby, now the oldest settler in the township ; Hiram, who married Maria Van Etten, of Spencer, N. Y., and lived on a part of his father's farm until his death, in 1874 ; Harvey, now in Colorado; and Miranda, who died unmarried. Thomas Wilcox never resided in Albany, but lived and died in Milltown, about three Miles north of Athens. Lois Wilcox married Timothy Alden, and lived in the stone house in Monroeton. Eunice married Humphrey Goff, and lived and died also in Monroeton. Desire married John B. Hinman, and lived in Monroe. Amy married Eleazer Sweet, and also lived in Monroe, on the Jonathan Fowler place. Jemima married Cornelius Coolbaugh, and lived in Wysox. Rowland Wilcox became a heavy land-holder, owning at one time eleven hundred acres. The Mr. Granger who came in with the Ladds and Fowlers made a beginning on the top of Wilcox's hill, where he took up fifty acres. planted a piece of corn, went back for his family, and died. His sons, Calvin and Dorus, came on and harvested the corn, and stayed a year or two, and then returned to their home in Vermont, and Charles W. Ladd took the lot. Daniel Miller came in also in 1801, from Sussex Co., N. J., and located where his son, Russell Miller, now lives. John B. Hinman also came in with the first settlers; was the son of John Hinman, of Wysox, and was the next settler below Wilcox's. A saw-mill now stands on the place. He sold to Humphrey Goff, who came in about 1810, and removed to Monroe. Goff sold to Freeman Wilcox, and also moved to Monroe. Jonathan Frisbie came in 1803, and settled on a tract on which the Eilenberger trout-ponds are now situated. He built his house on the knoll just above the spring which feeds the ponds, which gave his name thereto. He had a large family of boys, but went west after about ten years. In 1810, Williams Lee came in from the great Van Rensselaer patent or manor in Albany and Rensselaer Cos., N. Y. He went into the house with Jonathan Frisbie at first, but in a short time moved into his own cabin. He removed to Hibbard hill in 1823, cleared about fifty acres, and left it. Amzi Kellogg came in from Connecticut in 1812-13, and lived in a log house south of the Wilcox tavern. He afterwards went down to near where his son Ezra now lives, where he bought a farm. Archelaus Luce came from Vermont about the same time, and settled west of the turnpike, beyond Kendall's mills, but stayed only five or six years, and left for other parts. William Miller came in 1817, and settled on the farm where Stevens now lives, selling the same to Stevens in 1825-26, and removing to Sullivan county. John Foggarty (alias William Bowland) came in in 1819. He was an Englishman, and having been impressed into British naval service deserted, and, to escape detection, assumed the name of his mother's family, Foggarty, by which he was ever afterwards known. He sold his farm in 1829 to Samuel Brown, and went west. He lived for a time in his house, with neither door, window, or chimney in it. John Nichols came from Connecticut to Albany, N. Y., and thence to the township of Albany, in 1819, and settled on the hill east of New Albany, on the farm now occupied by George Lenox, who married Julia Ann, the youngest daughter of Mr. Nichols. This farm was on the Clymer lands, of which he and his son-in-law, Chapman, bought four hundred acres. 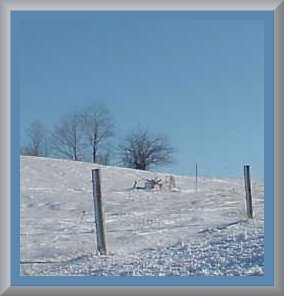 Mr. Nichols lived for a short time on the Gregg hill, near Towanda, where Wm. Gregg recently lived. Nichols was a basket-maker, and had both reputation and pride in the manufacture of that article. While living on Gregg hill, he offered to make for a neighbor a basket, containing one and a half bushels, for as much wheat as the basket would convey water from a spring to the house, a distance of a few rods. The offer was accepted, and Mr. Nichols began his work. Selecting and thoroughly seasoning his splints, which were cut very narrow, he wove them as closely as possible, and then soaked the basket in water, which expanded the wood and closed the interstices. He then summoned the neighbor, and going to the spring, filled the basket with water and carried it to the house, the fluid standing about an inch only from the rim. The price was paid. Simeon Chapman came from Vermont in 1813, when a lad of sixteen years, to work on the Berwick turnpike. He came to New York State with Mr. Nichols, whose daughter he afterwards married, and settled on the hill east of New Albany, where he lived until his death. Peter Steriger came from New Jersey to Norristown, and thence, in 1824, to Albany, and settled on the farm above the one owned by Russell Miller at the present time. He sold it to Stephen Murphy, and it is now occupied by a son of Murphy, named Adam. Hugh Cavanaugh came in about 1830. Chauncey Corbin, son of Oliver Corbin, who moved into Warren township in 1801, was born in 1808, and came to the farm he now lives on, in Albany, in 1843. One Campbell had previously cleared up a small lot on it, of whom Corbin bought. It was the first farm purchased between the turnpike and the river. Previous to any of the settlements before named the French had made several clearings and built several houses. One of the latter was on the place afterwards owned by Daniel Burdick. At the time the Ladds and Wilcoxes came, in 1800-1, these houses were in ruins, and the French leader had been drowned in the Loyal Sock, near the forks of the stream, where it has a rough, rocky bottom, and a rapid current when swollen by melting snows or rain. Henry Hibbard came to Albany in 1827, from Standing Stone. His father was Jedediah Hibbard, who had a large family of sons and daughters. He came to Hibbardtown when it was a wilderness, cleared up a large farm, and erected good buildings. He was a successful hunter also, being a sure shot. He died Jan. 1, 1877, aged eighty seven years. David Sabin was also one of the pioneer settlers of Albany, and his descendants are still residents of the town. Silas Moon came to Albany from Peterborough, N. H., about 1842, and located on Moon street, where he still lives, at an advanced age. Deacon James Allen came from the same neighborhood and at the same time with Mr. Moon, and settled near the latter, where he died. He was a deacon in the church at Albany. The population of the township by decades, since 1850, has been as follows: 1850, 1043 1860, 1137, 1870, 1379. Of this latter number, 1281 were native born and 98 foreign born. The first saw-mill was built a little below Wilcox's tavern in 1820, by the Wilcoxes, and a saw-mill still occupies the old site. Mr. Miller built one where the old French mill stood, about the same time. Since then these mills have been numerous. Along the creek the timber was hemlock and in great abundance, on the ridges the hard woods were found. Many of the hemlocks, on the creek bottom would measure four feet across the stump. The first families who came in were obliged to go to Monroe to raise such grain as they had on the flats, and were compelled to go to Tioga Point and with ox teams to get the same ground. Whoever went took the grists of the whole neighborhood. The Berwick Turnpike was built by a chartered company. It begins a mile from Berwick, Pa., and runs to the State line, and was called the "Berwick and Tioga Turnpike" A man by the name of Andrew Shiner contracted to build the road over the North mountain in 1817. Having completed this, be contracted to build over 40 miles farther, at the rate of $1150 per mile, with extra pay for the bridges, and to take half his pay in land, at $2 per acre. The contractor sub-let the job in sections to parties, as it would suit their convenience. Russell Miller built 1 mile near his house, the Wilcoxes built 2 1/2 miles below, Shadrach Miller a mile above, Daniel Miller and William Miller the next mile above, and Mathias Van Loon the next mile above him. By this means many of the settlers secured their farms. This turnpike was projected by those who owned large bodies of land, for the purpose of opening their land to settlers. The State made a grant of $575 worth of land at $2 per acre, per mile of road, to the company, which was just half the contract price for building the same. The road was constructed through Albany township in 1819-20. The company forfeited their charter, and finally abandoned the enterprise about September, 1847, since which time it has been a public road. The first road cut into the township was the track cut by the Wilcoxes and Ladds, when they came to their locations in 1800-1. It is thought that Louisa Alden, a daughter of Timothy Alden, taught the first school in the township, in 1812. Mrs. Charlotte Ormsby, the oldest settler in the township at the present time, was one of the pupils of that school. The school-ma'am married Warner Ladd, a son of Ephraim Ladd, and who built the stone house at New Albany. This school was taught in one of the rooms of Ephraim Ladd's house. Anna Luce taught the first school in the first log schoolhouse built in the town. The statistics for the school year ending Sept. 1, 1877, give the following exhibit of the common schools of the township: There were nine schools taught during the year, averaging six months each. Two male and sixteen female teachers were employed, with an average salary of $22.50 per month for the males and $21 for the females. There were 257 male and 221 female scholars who attended the schools. The taxes levied in the township for the support of these schools amounted to $1017.87; $363.60 were received from the State, and the total income for the year was $1526.23. Of this amount $1143.72 were paid to teachers, the total expenses being $1322.72. The Methodists have a house of worship it Laddsburg, and the Methodist Episcopal church has one at New Albany, the history of which societies will be found at length in the general history of the county. The first preacher who came to the settlement was a Methodist Episcopal clergyman, who preached once each four weeks. His first advent among the people of this township was in 1811-12. The Ladds, who were Presbyterians, procured the occasional services of Rev. M. Miner York, who lived at the time in Wysox. Daniel Miller, died Oct. 8, 1856, aged 77 years, 9 months, 2 days. Hannah, his wife, died March 20, 1850, aged 69 years, 11 months, 13 days. Horatio Ladd, died Jan. 12, 1850, aged 69 years, 11 months, 22 days. Asenath Ladd, died Aug. 28, 1854, aged 78 years, 10 months, 20 days. Eunice, wife of Samuel Smith, died Aug. 11, 1848, aged 76 years, 11 months. James Allen, died Sept. 13, 1862, aged 69 years, 10 months, 13 days. Susanna, his wife, died Nov. 8, 1854, aged 59 years, 5 months, 17 days. Rev. Robert Baird, born Westchester Co., N. Y., Nov. 20, 1794, died Oct. 13, 1860. Abraham Waltman, born May 22, 1801, died Dec. 21, 1863. Roxana, his wife, born Oct. 14, 1 803, died Oct. 25, 1868. Daniel Waltman, born Dec. 18, 1830; enlisted in 49th P.V. - missing at battle of Wilderness, May 10, 1864. Wm. Waltman, born Oct. 14, 1841; same regiment; died at Raleigh, N. C., May 3, 1865. Sylvenus Waltman, born July 13, 1836; same regiment; died at Portsmouth Grove, R.I., April 29, 1865. Daniel F. Miller, died Dec. 13, 1863, aged 48 years, 11 months, 17 days. Elizabeth, his wife, died June 15, 1857, aged 40 years, 3 months, 29 days. Horatio J. Ladd, was killed Dec. 23, 1869, aged 33 years, 7 months, 21 days. Susanna, wife of M. J. Ladd, died Oct. 25, 1863, aged 61 years, 2 months, 17 days. William Zaner, born in Columbia Co., Pa., February, 1797 ; died March 12, 1866. Archibald Thomas, died April 30, 1859, aged 65 years, 7 days. Lillis, his wife, died July 10, 1860, aged 61 years, 2 months, 18 days. Mary, wife of Hiram Crandall, died July 30, 1856, aged 50 years, 2 months, 15 days. Elisha Crandall died Dec. 10, 1860, aged 80 years. Nancy, his wife, died April 8, 1857, aged 80 years. Elizabeth, wife of Eliphalet Sweet, died March 23, 1864, aged 72 years. Eunice, wife of Daniel Burdick, died Jan. 24, 1870, aged 69 years. "On Wednesday, July 20, a number of the people of the town of Franklin had assembled to raise a barn in that neighborhood. After raising a portion of the frame, they were proceeding to raise one of the broadsides, when the standing part, being but ill supported by some rafters placed in a transverse position, instantly fell and wounded Mr. Ezekiel Ladd and Mr. Daniel Calkins, the former of whom was bruised and disfigured in a most shocking manner, and survived the fatal event but one hour. Mr. Calkins, we understand, is wounded so dangerously that his life is despaired of. Mr. Ladd was a worthy and respectable man, had arrived at the age of seventy-two years, with an unblemished character and the universal esteem of his numerous friends." The Wilcox pioneers are buried in the cemetery at New Albany. When Ephraim Ladd came into the township with his family he stopped one night with the Fowlers, in Monroe, and during the evening the family had their hair cut, whether because they were going so far into the woods they feared they would not soon have another opportunity for trimming up, or as a precaution against the scalpina proclivities of their red brethren, it is not said. The next morning they started up the creek with seven or eight teams, en route for their location. The first day they made six miles only, and found shelter (?) in the remains of an old log house, roofless, canopied only by the stars, and from the inside of which they had to first shovel the snow before they could make their beds. This resting-place was where the Wilcox tavern now stands. The second day they reached Mr. Ladd's house, in what is now New Albany. The weather was cold, and the creek was crossed many times, during which crossing the water would run into the stake-holes in the beams of the sleds, and afterwards freeze, and cause the stakes to fly out and the load to glide off. It required a good stock of patience, as well as endurance, to make that journey. A half-blood indian once stayed overnight with Mr. Ladd, who had been to Washington as an interpreter for the Six Nations. He described localities, springs, noted landmarks, etc., with as much accuracy as any of the old settlers. Wells Wilcox, son of Sheffield Wilcox, Jr., has an old flint-lock rifle in his possession, with which in the forty years he has owned it be has killed more than 800 deer, six of which were shot in one day, besides bears, elk, etc. In the second war of American Independence, a draft was ordered and made in 1814. Horatio Ladd, C. W. Ladd, Daniel Miller, Freeman Wilcox, Rowland Wilcox, and Humphrey Goff were drafted to defend Washington, but, owing to the "law's delays," the draft was not made until it was too late for the men to be of any service. They went as far as Danville, where they were discharged after a month's absence. After the drafted men went away, there was but one militiaiman left in the township. Laddsburg has a store, post-office, grist-mill, church, and about a dozen houses. New Albany is the place of most importance in the township, having one church, Odd Fellows' lodge, store, post-office, and about twenty dwellings.